For years I've made THIS pancake/waffle recipe and everyone loves it. But when I came across this new one, which uses WHOLE grains (as in NOT flour, but the actual wheat berries) I liked the idea of getting more varied grains into our diets. Especially now that I have my Bosch blender to easily do the work. These days the wheat crops are so “dumbed down”, or hybridized, meaning they're not very close to what the original grain of wheat looked like a thousand years ago. Whole wheat is becoming a big business, so of course they have to mess with it – I like to try to use other grains that are closer to what our ancestors ate. I also liked the idea of using 100% whole grains in this recipe. Whereas when I make my other recipe above, I usually add part organic unbleached white flour or Einkorn flour to give it a lighter texture and flavor. I thought it would come out heavy and grainy – my palate is picky about this stuff. I used part organic brown rice, part oats, and part barley the first time. The next time I used oats and soft wheat berries, just because those were the grains I had on hand. Like Sue Gregg explains, you are not using flour in this recipe, you are using whole grains, the whole berry (wheat, spelt, kamut, barley, etc. ), the hard uncooked rice, or the uncooked oats. Mix it up, use different grains! They turned out light tasting and yummy – using 100% whole grains! DID YOU KNOW NOT ALL WHOLE GRAINS ARE HEALTHY? Another thing I love about this recipe, (like my other one), is that it is soaked overnight in an “acid medium” – in this recipe I used buttermilk – something acidic breaks down the phytic acid overnight to make this a very nutritious way to eat whole grains – read more about why “soaking” grains is important. You could also use plain yogurt or some whey for the acidic component. 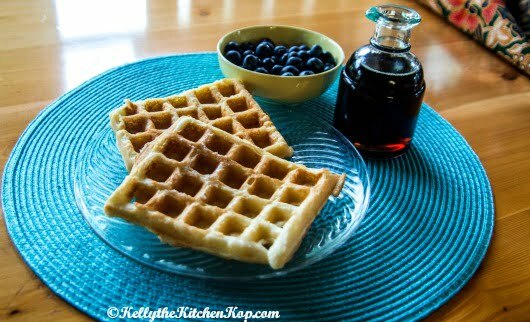 Click here for the recipe: Sue Gregg's Blender Batter Waffles/Pancakes. Here are the organic grains I have experimented with and they have all been good: barley (I happened to have it in my pantry from a soup I made a while back – normally I don't use this much), soft wheat, spelt, oats, & brown rice. If you use something different, comment below and let us know. Should we be eating breakfast cereals? Where to buy Coconut Oil and WHY it is so good for us! You have got me so excited to start making bread and just overall kicking my real food cooking up a notch- thank you for all of the great ideas on your site! Up until I found your site, I was convinced I wanted a vitamix for my birthday next month. Now I’m seriously considering the Bosch you recommend (curious what model/etc you have)……..can you or any of your readers comment on the difference between the two besides the fact that Vitamix (or so I assume) cannot make bread? Can the Bosch do everything else the Vitamix can- smoothies with whole apples, ice cream, soup, etc? Help! I definitely do not want to have to buy both! I tried some that did NOT turn out good. I did half oats and half barley, soaked in raw milk and homemade yogurt in my Vitamix. Added egg and baking soda the next morning, then fried them on a cast-iron waffle grill on my stove. They were not AWFUL, not utterly inedible, but… well, we tried a few bites, then decided to have toast for breakfast instead. I’m probably going to try half oats and half wheat next. If that doesn’t give pretty good waffles, I’m going to assume you guys have very different taste than me! Fruit juice is very acidic. A slightly acidic medium is need to breakdown phytic acid, but the work is done primarily by an enzyme within the grain called phytase. Phytase works in an acidic medium, which is why the so9lution must be acidic. Brown rice and oats have little phytase, so soaking them doesn’t help much, unless soaked with another grain. That’s why I did half barley in my trial above, as there’s little point in soaking oats by themselves. Bummer, maybe it was the barley, I’ve never tried that one before. I do the oat/barley combination regularly. They are my wife’s favorite (I prefer kamut). I use 1/2c oats and 2/3c barley; 1 1/2c buttermilk; 1 egg; 2T oil; 1/4-1/2t baking soda; 2t baking powder; and about 1t salt. I soak the buttermilk and grain overnight and then add the egg and other ingredients in the morning. Usually I have to add more milk/buttermilk as well till I get a decent vortex. A couple of things that can make them taste bad are too much acid or too much baking soda. It’s hard to hit the nail on the head with that. Whatever you do don’t put in too much soda. But if your buttermilk is really sour then adding more baking soda will help to neutralize the sourness. In this case the soda actually sweetens the pancakes even though it doesn’t taste sweet itself. Occasionally I add a couple tablespoons of maple syrup to sweeten them as well. In addition, according to traditional Chinese medicine, it is best to eat warming energizing foods in the morning and more cooling calming foods in the evening. Wheat is actually a more cooling grain whereas oats are very warming and energizing. 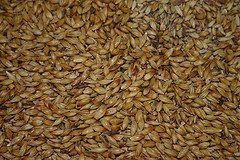 Barley is more of a cooling grain and thus they somewhat balance each other out. So in general I would say it is good to add oats to your breakfast foods because most of the other grains are cooling. oh hi again i meant to say “your recipes are absolutly amazing”. Barb, I’ve never heard anything about fruit juices being a good soaking medium, but I may have heard something about kombucha, since at times it is quite acidic, like vinegar. Sorry I don’t know this for sure! Maybe someone else can jump in? Reading through the comments, I saw the one about using fruit juice and I wonder, aren’t most fruit juices by nature acidic? I’m only on the fringes of NT study, but would the fruit acid accomplish the same breakdown of phytic acid…or is it specifically lactic acid (dairy-based) that’s needed…oh and what about kombucha as a soaking medium ? Oh, and what I found as per Sue Gregg is that you really need to add buttermilk until you get a decent vortex – at least on my Bosch. It doesn’t need to be a big vortex, it just needs to be there at least a little. If you don’t get the vortex then it will be too thick. I make the Sue Gregg recipe all the time. My family loves them. They like them even better than standard white-flour pancakes. My 2 favorite variations are oats+barley (2/3c barley + 1/2c oats, 1 1/2-1 3/4c buttermilk, 1 egg, 1T maple syrup, 2T coconut oil, 1t vanilla) and kamut (1 1/2c kamut, plus an extra egg). The last time I made the kamut ones my wife and I both agreed they were the best pancakes we’d ever had. But I can’t get them to consistently turn out that way for some reason. When you add an extra egg as I do with the kamut variation, don’t cook them as long. They dry out faster. It does make them fluffier though. I made these for the first time this morning with the oats, spelt, and brown rice. I can’t believe how easy this is, and that there is no flour or sugar in these! My family loved them (they are used to my whole wheat pancakes anyway). I made a double batch in my 400 watt blender, which did the job, but I am pessimistic that it will make tons of batches this way. I got 24 pancakes. I could have fit 3 batches in it. I am so grateful for this recipe, and for all you do, Kelly!! The only thing you may want to think about though, is that buttermilk is a bit acidic, and this is what breaks down the phytic acid in the whole grains. You could also use yogurt, kefir, whey, etc., but juice won’t have the same affect to make these as extra nutritious as they could be. Let me know if you have questions…all this was a totally new concept to me not long ago. This is a GREAT recipe. I have been making these for the past 2 years or so. I had this in my menu plan last week. We make these all the time. I hardly ever use buttermilk (since I don’t have it on hand) I use a fruit juice of some sort – what ever is open and that adds plenty of sweetness to not need syrup also. Great ideas of different grains to try with it, I have some Quinona in the pantry will have to add some of that for next time. My family also agrees with you and others that this is the best pancake ever. There are no “after pancake jitters” with these–they keep a person full and satisfied . I even like them with just butter, no syrup. Also any leftover batter keeps well in the fridge. The Bosch blender does a fine job of blending the whole grains, and so does the Vita-Mix. I’m a big fan of this recipe. The Vita Mix does a killer job of taking care of business! I have used rice, quinoa, and millet (thankfully I seem to not have a significant reaction to the millet as mentioned above). I like rice-millet the best, but plain rice is good too. These are the best! Do you want to meet somewhere and I’ll give you a half cup of my buttermilk starter??? Good to know about Millet – thank you! So millet might not be one of those whole grains to include in a multigrain pancake batter, soaked or not. I have the Sue Gregg Breakfast cookbook. Just a word – I tried this in my “old blender” and it came out AWFUL. You really need a high powered blender for this to work. Your blender should be able to crush ice easily. I haven’t tried it with my Bosch blender yet – but you’ve got me interested again! A question though – can I get buttermilk culture at Harvest Health? Or, do I have to order it from someplace like New England Cheese Supply? I’m assuming I could use buttermilk I buy until I can get some of my own made?